What is the chance of these randomly chosen three points passing on an half circle? 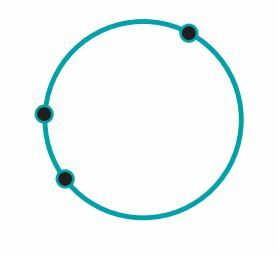 The first dot can be considered a single position, because we can always rotate the circle. The second dot can always be considered as not crossing the half line, because we will simply redefine which half we're talking about depending on where it falls. Thus the second dot can fall anywhere within half the arc of the circle. The third dot must fall within the other half (50%), AND also opposite to the arc between the first 2 dots (another 50% on average). If it falls on the opposite half but outside the opposite of the arc, then the half can just be redefined to contain all 3 dots again. Multiplying those probabilities gets us 25%. 50%. The first two points will always be on a half-circle, the chance that the last point is on the same half-circle is 1/2 or 50%. The image above illustrates the possibilities: in stage #1, it really doesn't matter where you place the first point, it just becomes the reference for the following points. For stage 2, point #2 will end up on a half-circle with point #1, pretty much by definition. It has to be on the same half circle. So two points down and still at 100% probability. So it all comes down to the last point. There are two major cases, counting clockwise: 1, 3, 2 or 1, 2, 3. 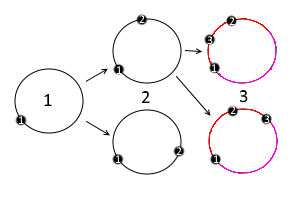 No matter the order, as long as point #3 ends up on the same side of the circle as point #2 (with reference to point #1) (depicted as red vs. pink in the diagram), all three points will end up on the same half circle. Now, if the points are close together, the probability actually increases, approaching 100% as points #1 and #2 approach each other. This can be envisioned by swapping points #1 and #2. Nevertheless, the minimum probability is 50%. Not the answer you're looking for? Browse other questions tagged geometry probability or ask your own question.